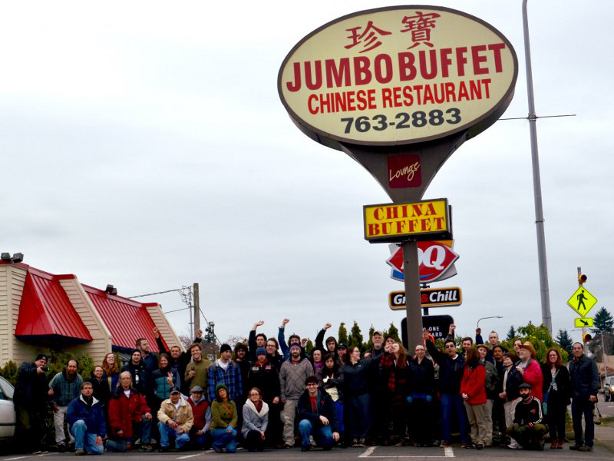 After a three month fight Marco and Seasol have won our campaign against Jumbo Buffet in White Center. Marco received $4700, making up for the months of working under mininum wage with no breaks or overtime pay. After a three month fight Marco and Seasol have won our campaign against Jumbo Buffet in White Center. It all started when Jumbo refused to give Marco breaks, overtime pay, or even to pay him minimum wage. That's right. Marco worked ten or twelve hours a day washing dishes for a flat rate of $60. This came out to about $6 an hour, well under the required legal minimum. When confronted about it, Kevin, the Jumbo manager and nephew of the owner, simply refused to pay more. After four months Marco had enough. Through a friend he learned about Seasol, gave us a call, and quickly became a member. With Marco we agreed to take on the fight. Our demand delivery was monstrous. We literally shook the floors and windows with our clapping and stomping. With fifty plus people backing him up, Marco demanded his back wages, a total of $4700. At our first picket, with Marco leading the way, we shut down their lunch rush, emptying out their parking lot in just an hour's time. We had inside information and continued our pressure campaign, targeting their busiest times: Sunday after church, Friday evenings, and Saturday afternoons and evenings. Each time we would empty out or nearly empty out their parking lot, turning away dozens of potential diners, with a loss of hundreds and hundreds of dollars each action. We knew it was only a matter of time before they caved. The emptier their parking lot, the better we felt. One big element of our success was the enormous community support from the people of White Center. Neighbors showed up to each picket; drivers honked; people waved; neighboring businesses put our leaflets in their windows; diners turned around in the middle of the entrance once they learned Marco had been treated so poorly. Children from across the street made their own "boycott Jumbo" signs and posted them in front of their house. Kevin and Jumbo had no idea what was in store for them. It took them several months to figure out that we could shut them down and drive them out of business if they refuse to pay Marco and their workers. Once it became clear we could destroy their business, they tried to negotiate, promising more and more money, up to $3000. On one such phone call with Kevin, Marco told them, "Don't be stupid, Kevin – I don't negotiate with my own money." After three months of pickets and actions, a final day long call-in to Jumbo management pushed them over the edge. We set up a meeting, and Marco got all of his back wages! This fight was a lesson in solidarity for all of us. With the support of the community we put a major squeeze on a cheating boss. The best part is that Marco has become a star organizer - already soliciting new fights with new workers in White Center. In Marco’s words: "without the help of the community of White Center and the help of Seasol it would not have been possible to recuperate the money that I was owed . . . a million thanks to Seasol and White Center."